There are tons and tons of webcomics on the Internet, but it's extremely rare that one gets adapted into a television show or a movie. We delve into the rich world of long-form webcomics and pick out a few we'd love to see on our TV screens. The truth is, a lot of webcomics are perfectly suited for the comics format, with much of their charm coming from the very specific timing of the comic pages and the static art style. The webcomics below tell longer stories—whether in episodes or in a gradually unfolding story—that we think would bring something interesting to the television landscape. They're all science fiction and fantasy webcomics and they've all been running for a while—although there are certainly newer webcomics we'd already love to see on television. We didn't include webcomics that are shorter, self-contained stories that might be better for a movie (comics like Nimona and The Fox Sister come to mind). Any webcomics you'd love to see in live-action or animation? Let us know in the comments. Gunnerkrigg Court by Tom Siddell: The episodic Gunnerkrigg Court is already structured very much like a TV show, with discrete stories that build up the universe over time. Plus, it has great characters and a fascinating setting. When Antimony "Annie" Carver is first dropped off at her shadowy industrial school, she immediately realizes there's something strange about the place. Gradually, she's caught up in a world of ghosts, gods, and robots—and when she isn't dealing with her fellow students, she's caught up in the conflict between the technological Court and the magical forest across the river. It could be neat as a live-action series, but figuring out how to make Coyote would be tricky. Dicebox by Jenn Manley Lee: If you're looking for the next Firefly, you might consider Jenn Manley Lee's Dicebox for inspiration. 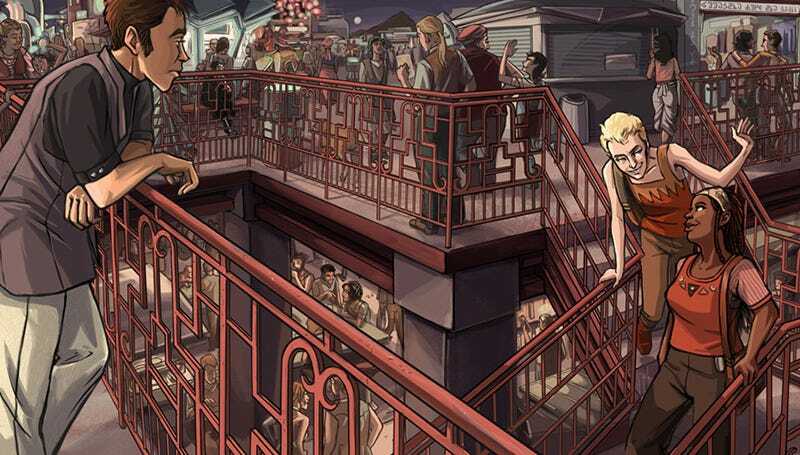 The comic follows two migrant workers, Griffen and Molly, as they travel from job to job on space stations, spaceships, and terraformed planets. Naturally, the pair are always getting into trouble, and as the series goes on, it becomes clear that these two harbor some secrets. It's a great road tour through the working class future. The Zombie Hunters by Jenny Romanchuk: "But I've had enough of zombies!" you say. Yes, we've already got The Walking Dead and now Z Nation on TV. But, like the best zombie stories, what makes The Zombie Hunters exciting is its human characters, not its zombies. In the post apocalypse, the remnants of humanity live in relative safety on an island where a two-tiered class system has emerged. Those infected with the zombie virus—who will turn into zombies when they die—are treated as second-class citizens. They're also most likely to be sent out into the zombie-filled lands on salvage missions. The comic is a great blend of zombie-killing action and post-apocalyptic social drama as it follows one team of salvagers, some of whom are very broken people. Their double lives on and off the island would translate neatly on screen. The Adventures of Dr. McNinja by Christopher Hastings: Seriously, how do we live in a world without a Dr. McNinja animated series? The lunatic adventures the physician who is also a ninja would be perfect for a cable channel or streaming service. Someone make this happen. Please. Cucumber Quest by Gigi D.G. : While Dr. McNinja would make a great adult animated series, Cucumber Quest would be delightful as an all-ages animated series. This send-up of fantasy tropes featuring a wannabe wizard bunny and his aspiring knight sister off on a quest would fit in well with shows like Adventure Time and Steven Universe. It's a trip. Spacetrawler by Christopher Baldwin: Baldwin's sometimes funny, sometimes heartbreaking tale of a group of alien abductees from Earth caught up in an intergalactic war has come to a close, but it would take the span of a television series to retell it. And while it would be neat to see Baldwin's artwork animated, we would love a practical creature shop to take on his wonderfully varied alien beings—although that might get expensive after a while. Broodhollow by Kris Straub: Supernatural mystery shows are a dime a dozen, but Straub creates mysteries that are both creepy and stylish. This tale of a man suffering from debilitating superstitions coming to a town where nearly every day is a holiday is punctuated by unsettling revelations and some wonderfully disturbing images. There are a lot of mystery shows that could stand to take a page from Straub's playbook. Lovecraft is Missing by Larry Latham: Another piece of historical horror that would make for great TV is Latham's take on H.P. Lovecraft's mythos. After Lovecraft suddenly vanishes from his Providence home, a Brown University librarian, a Catholic priest, and a writer of weird tales all find themselves caught up in a battle against Eldritch forces that could spell doom for humanity. There are plenty of shout-outs to fans of Lovecraft's stories, plus plenty of creepy settings and grotesque characters. Trekker by Ron Randall: Really, a Trekker series seems like a no-brainer. A female bounty hunter tracking her quarry through a retrofuturistic city? We want. Strong Female Protagonist by Brennan Lee Mulligan and Molly Ostertag: While superhero shows are taking over television, Strong Female Protagonist offers something different: a story about a superhero who doesn't want to be a superhero anymore. Alison is superstrong and invulnerable, but she worries that she's not actually making a difference as Mega Girl. So she hangs up her mask and goes to college instead. The series partially explores what life is like for a superpowered lady in college and partially explores how various superpowered characters try to change the world. With superheroes dominating our movies and TV shows, it would be nice to have an onscreen character questioning what it all means.